Mike Malouf Jr. primarily practices in the areas of personal injury, wrongful death, and bad faith insurance. He graduated from the University of Mississippi in 1992 and received his law degree from Mississippi College School of Law in 1996. Mike is very active in the legal community. He is a past officer of the Jackson Young Lawyers Association, where he served as Treasurer, Child Advocacy Chairman, Social Chairman, Membership Chairman, and a Sykes Boys & Girls Club Tutoring Program Leader. In 2000, Mike was recognized by JYL as an Outstanding Young Lawyer. In 2001, he was an Associate Member of the Charles Clark American Inns of Court. 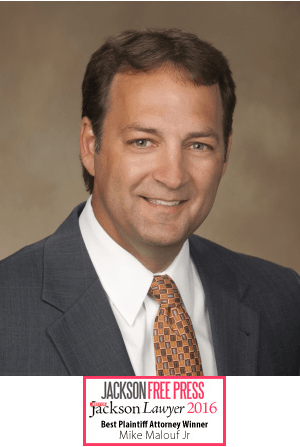 He is also an active member of the Mississippi Barm where he served on the Board of Directors for the Young Lawyers Division and Child Advocacy Committee. Mike is also currently serving as President of the Capital Area Bar Association. Mike serves on several boards, including Jackson Metro Habitat for Humanity and Jackson Futbol Club. Mike is married to Susan Stanfill Malouf and is the proud father of a daughter, Ann Leighton, and two sons, Michael, III and Chambers. Contact Attorney Mike Malouf Jr. for help with your legal situation in Jackson.